Kombucha is a fermented tea that has been gaining popularity for the past couple of decades among the health-food crowd. Today, the beverage is showing more signs of crossing into the mainstream, as consumers are drawn to its probiotic content and promises of wellbeing, and restaurant operators see it as an on-trend beverage to serve alongside nitro coffee and cold-pressed juices. 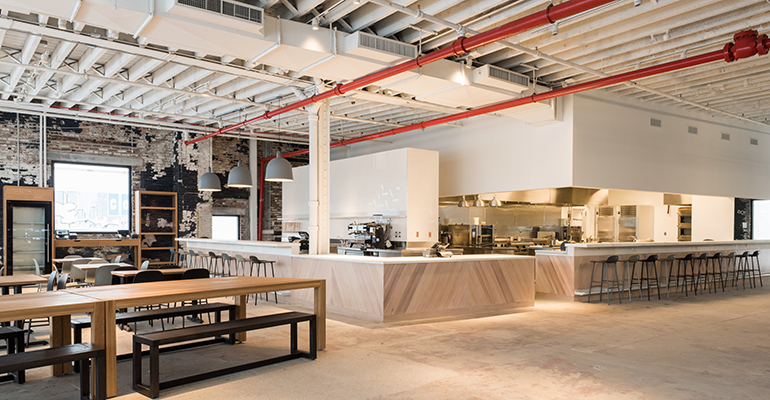 “It seems to us as a no-brainer,” said Nick Porpiglia, general manager of Norman, a casual New Nordic restaurant that recently opened in A/D/O, a new design space in the trendy Brooklyn, N.Y., neighborhood of Greenpoint, where he said even local bodegas carry kombucha. “We’re seeing it more and more in restaurants,” he added. Kombucha is made by adding sweetener, usually sugar, to brewed tea, along with scoby, an acronym for “symbiotic colony of bacteria and yeast.” Kombucha from a previous batch is also typically added to the new one. Similar to mother of vinegar, scoby catalyzes the fermenting process, in which yeast converts sugar to alcohol and bacteria converts alcohol to acid, resulting in a tart, lightly carbonated drink that’s generally low in alcohol — most producers keep it at less than 0.5 percent so it remains classified as non-alcoholic. The beverage has a reputation — still largely unsubstantiated by science — for improving digestion, boosting the immune system and generally energizing those who drink it. McGill serves kombucha on tap at Hitchcock on Bainbridge Island, as well as at Hitchcock Deli and the new Café Hitchcock, both in Seattle. And, if he doesn’t want to drink alcohol, “it’s a great way to wrap up a shift. It’s a surprisingly great replacement for having a beer,” he said. McGill used to make his own kombucha, but he wasn’t able to keep up with demand. So he turned to Iggy’s, a local producer on Bainbridge Island that uses local honey as the sweetener and forages for aromatics to add to the brew. All three restaurants charge $7 for a 12-ounce glass. Plus, the flavors produced through fermentation give the beverage a complexity that you can’t get through seasoning, he noted. At Norman, Porpiglia and his team make kombucha in-house using a blend of Indian green tea, Chinese green tea, licorice root, peppermint, spearmint and sugar. The beverage is fermented for about two weeks in a covered, non-airtight container. It’s transported in air-proof bladders to a local company that kegs it. The kombucha is priced at around $4.50 a pint. Brider in Denver also makes its own kombucha. To start, sous chef Martin Russell's scoby is added to a large, concentrated batch of Tea Smiths’ Black Oolong Tea sweetened with Colorado honey. Next, assorted flavorings are added to the tea and allowed to ferment for a quick three to five days. The kombucha is strained and put in a 5.25-gallon keg on a large tap wall. “We encourage our three bartenders to decide what kinds of flavorings they want,” Isch said, such as apple-ginger, triple berry, and honey and lemon. Cranberry-ginger-apple is currently on the menu. Those ingredients are simmered with the tea for around 20 minutes, and then brought to room temperature before the scoby is added. The short fermentation time guarantees that the alcohol level stays below the legal limit of 0.5 percent, and also produces a mild-tasting kombucha that gives it appeal to a wider group of people, he said. Brider charges $4 for a 16-ounce mug of kombucha. Although Isch and Porpiglia add aromatics before adding the scoby, purists recommend against that for fear of damaging the scoby, which they say thrives best on tea and sugar. Canty serves ginger kombucha, which she gets from New England producer Aqua ViTea, on draft for $6 a glass, and also makes a cocktail, called Left at Albuquerque, from it. It’s made with carrot-infused gin, carrot cordial and turmeric tincture, as well as ginger kombucha, and is priced at $12. But not all operators have found that to be the case. 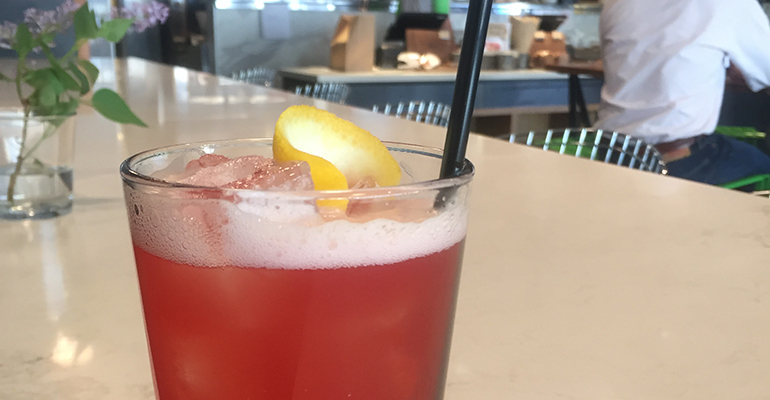 In Nashville, Tenn., Salt & Vine, a coffeehouse and meat-and-cheese market by day, and restaurant and wine bar by night, has served kombucha on tap since it opened last July. “We’ve sold maybe 10-15 [glasses] in that time,” said partner Hannah Schneider. “It seems thus far [kombucha] has only stuck with people in a specific trendy workout circle that go straight to the closest juice shop after their daily boot camp class,” she wrote in an email. Owner and sommelier Mattie Jackson agreed, saying the drink might stay stuck in the health-food segment. “Part of the slow sales may be attributed to the fact that committed kombucha drinkers aren’t considering a wine place to find their beloved beverage,” she said. But there are other uses for kombucha besides selling it as a standalone beverage. Apart from using it in cocktails, it’s finding its way into desserts. Brian Mercury, executive pastry chef of Oak & Rowan in Boston, has been brewing his own kombucha for the past few years, and has started making passion fruit sorbet from it. He uses mostly green tea to make kombucha and gives it a fairly long fermentation time of about three weeks. “I like it to be a little bit more zippy,” Mercury said, noting that it mellows out the sorbet’s intense passion fruit purée, adding to the appeal of both ingredients. The kombucha, although frozen, still seems to give the dessert a certain effervescence, he said. Although kombucha devotees take right to the dessert, others are hesitant. “Sometimes you have to hold their hand,” he said of guests, and he sometimes offers them a free scoop. But he has converted some guests to the flavor, and it’s now one of their favorites.